Nearby, in Kolkata Port, the heavy duty Human Powered Vehicles [HPV] are fully deployed. It truly is another world, Ray. Depaysement garanti ...impressionnant de voir ce mode de vie ! Ray: La plupart des choses à Kolkata me laissaient bouche bée et effrayée, Claudine. Most things in Kolkata left me open-mouthed and awed, Claudine. Something in me rebels against human beings having to be transportation devices. Ray: Oh...why is this so, Larry? Ray: Il est étonnant de voir à quel point ces véhicules peuvent être lourdement chargés, Martine. It is astonishing to see how heavily loaded these vehicles can be, Martine. Marvellous photojournalism Ray. I am intrigued as to why the bus needs a grill on the back window. Ray: Welded-on, heavy-duty grills seemed common on buses and trams in Kolkata, Chad, but I never did find out why. Ray: These vehicles seem to be exceptional strong, Alan, but are probably quite difficult to roll even when not carrying a load. It's quite amazing to see these things in action. I wonder what the life expectancy of the barrow pullers are? Probably quite short..
Ray: I don't know about their life expectancy, Chris, but would not be surprised if they lived a long time due to getting adequate exercise. Ray: I have seen these HPV utilities operating in India, Nepal and Bangladesh, Bill...still very common in South Asia. I think these trucks could be called crude but practical. Ray: I think you have described them well, Brian. 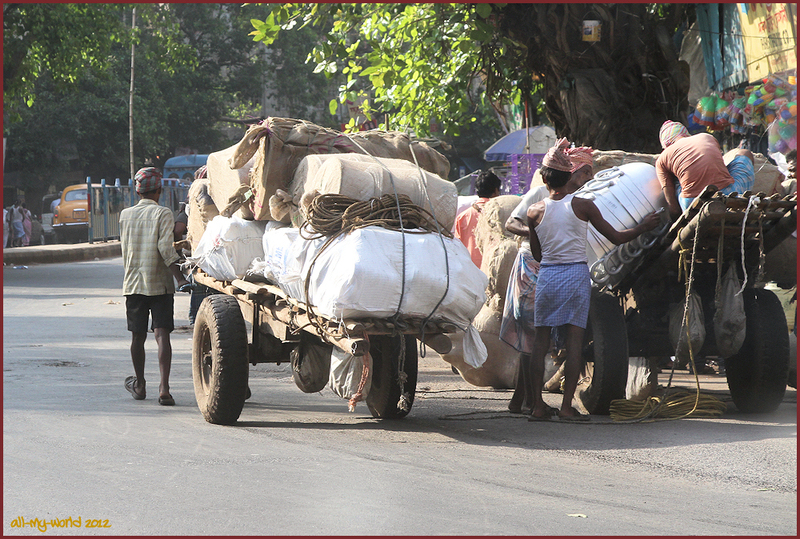 these human powered carts go into all the alleys of Kolkata where those big trucks would not be able to enter, Ray. and these are very hard working men. Easier than that fellow pedaling those four women.